If marketing whiz Jeff Hayzlett ruled the world, one of the first orders of business would be to outlaw the words "I can't." Hayzlett's book Think Big, Act Bigger: The Rewards of Being Relentless could vie for shelf space somewhere in between self-help and autobiography, but it belongs in the business section. He offers a glimpse into the blueprint that led him from growing up in South Dakota, to Kodak and to hosting a show on Bloomberg TV, which he then moved to an online platform as the C-Suite Network. He's built a little empire and isn't shy about telling us how he did it - not because he's bragging, but because he believes the rest of us can do it too. As with most business books I pick up, I had a healthy amount of skepticism for Hayzlett's. I cracked the first page praying that I wouldn't get assaulted with overwrought corporate platitudes. To the contrary, he offers his opinion bluntly and forcefully, but with the right amount of practicality and encouragement. For example, he addresses handling adversity in refreshingly non-corporate terms. Hayzlett does not overcome an obstacle, he steamrolls it. Don't accept the norm, he counsels, even suggesting that it's okay to sometimes "be a little pigheaded and irrational." He presses you to do what it takes to keep yourself motivated and pushing. Remember what I said about "I can't?" The book covers ground you may find in similar works, but Hayzlett offers the lessons with more alacrity. An opening anecdote in the book about profanity is one for the ages. In a chapter on focus, titled "Kill the Squirrel," he explains that you must relentlessly focus on what drives your business -- and fight off the urge of distraction. In another chapter, about staying connected with your customers and employees, titled "Clean Your Own Bathroom," he counsels that you can't expect your people to do the things you want them to do if you won't do them, haven't done them, or don't know them well enough to understand what needs to be done. And in yet another chapter, on having a servant mentality, titled "Reach Out and Touch Someone," he reminds us that people serve people, not companies. Companies are what people make them, and we should all strive to serve as many people any time we can -- because we can. The title of the book, which has a little bit of that corporate platitude DNA, makes sense. 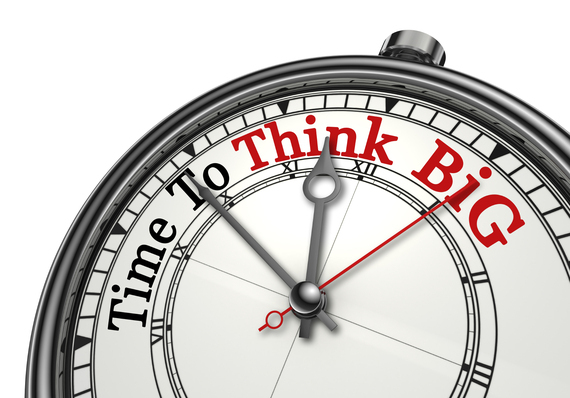 Think big, act bigger: Make bold plans but then don't be afraid to make them even bolder. Hayzlett told me that he wrote the book for business leaders, but after selling 300,000 copies since September, he has learned that corporate team members are buying it for their bosses, and his message is resonating across corporate departments. He also said he is humbled to find his book paired with motivational and self-help books on Amazon.com. All this from a guy from South Dakota who swears a lot, still wears cowboy boots, yet dares us to act bigger.